The combination of fruits and vegetable in a salad makes it more palatable, as it produces a very balanced taste and texture. This combination is such that it complements and brings out the best in each other. The combination of papaya, cabbage, bean sprouts and tomato is delicious. The tangy dressing and a crunchy peanut garnish add to its taste that one must try! 1. Combine the papaya, cabbage, spring onions, bean sprouts and tomatoes in a bowl and mix well. 2. Just before serving, pour the dressing over the salad and toss well. 3. 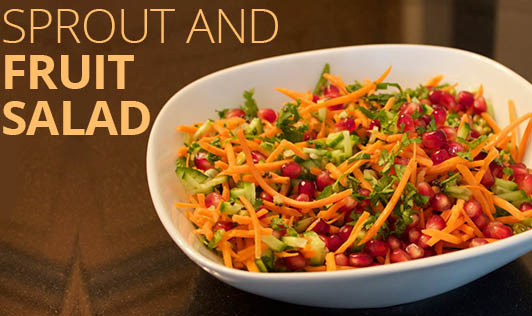 Serve immediately, garnished with the peanuts and coriander.